ProMelt™ Packaged Ice Melters are designed for use on sidewalks, entryways and parking areas, offering quick penetration to melt snow and ice fast. 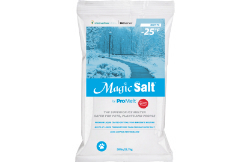 Magic Salt® by ProMelt delivers superior ice melting results at temperatures as low as -25oF. Treated with a high performance blend of agricultural enhancers and magnesium chloride, it melts snow and ice fast with long lasting results. 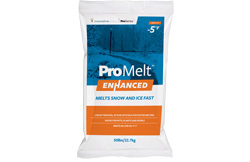 ProMelt Enhanced delivers superior ice melting results at temperatures as low as -5oF. Treated with a high performance blend of magnesium chloride and an organic enhancer it melts snow and ice fast. ProMelt Essential works faster than ordinary rock salt and melts snow and ice at temperatures as low as -18oC. This 100% natural product is a blend of magnesium chloride, calcium chloride, potassium chloride, sodium chloride and 15 trace minerals in each granule. ProMelt Essential is optimally sized for easy spreading. ProMelt Enhanced delivers superior ice melting results at temperatures as low as -20oC. Our natural complex chloride blend is treated with a high performance blend of magnesium chloride and an organic enhancer to deliver better melting results. Helps achieve longer lasting results and is safer for pets, plants and people. ProMelt Extreme delivers the fastest ice melting results at temperatures as low as -26oC. It is the ideal blend of natural complex chlorides and magnesium chloride pellets. Delivers a long lasting residual effect thereby reducing re-application frequency and is safer for pets, plants and people. 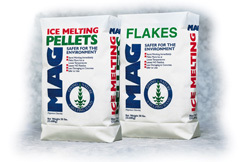 MAG is a high performance ice melter that effectively melts snow and ice immediately at temperatures as low as -25oC. MAG is less corrosive, less toxic and environmentally safer than salt and calcium chloride ice melters.